The Eagles lost again Sunday, this time to division rival Washington. The Skins are not a good team, though their defense has improved a lot, ranking second in fewest rushing yards allowed (at 78 per game). On the other hand, they had ten penalties, mostly earned, and key players were out injured (including WR DeSean Jackson and CB DeAngelo Hall). Newly acquired CB Chris Culliver — best known for anti-gay comments and his one-game suspension for hit-and-run and possessing brass knuckles — played gimpy and the Eagles abused him repeatedly. The first half was miserable for the Birds, as Washington’s aggressive pass rush pummeled QB Sam Bradford (sacked or nearly sacked six times on the first three drives alone). Even the good plays were quickly offset. 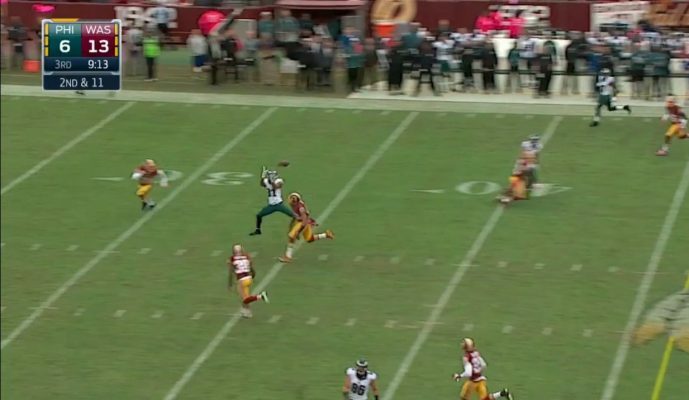 Rookie WR Nelson Agholor caught a 45-yard pass on the run, one-handed — and promptly fumbled a reverse on the next play, blowing what looked like a potential touchdown run. 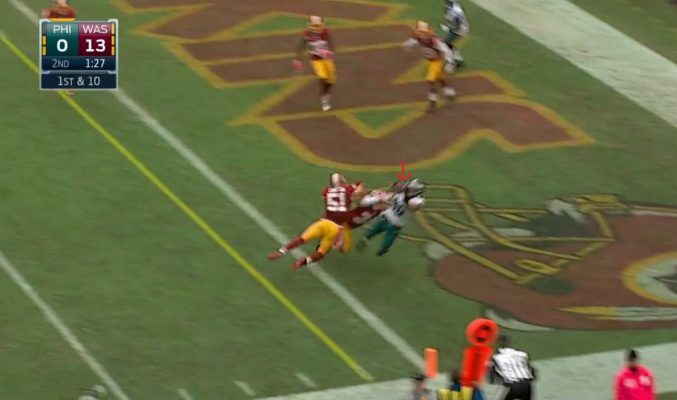 Then, after Darren Sproles ran a punt back 45 yards, the Birds started at Washington’s 30. After an eight-yard pass, a deep shot in the end zone that was overthrown, and an 11-yard run by Sproles, Bradford threw one of the best passes of his career, a precision strike to Ertz in the front corner of the end zone, just over two defender’s fingertips for a touchdown. Then Bradford was sacked, a 10-yard pass to Cooper wasn’t enough, and new kicker Caleb Sturgis missed an easy field goal. At 33 yards, it was identical to an extra point. And guess what? He missed one of those too in a three-point loss. The second half was a lot better. Bradford went deep again and again, hitting Riley Cooper for 62 yards (TD), Jordan Matthews for 30, and Miles Austin for 39 (and another TD). 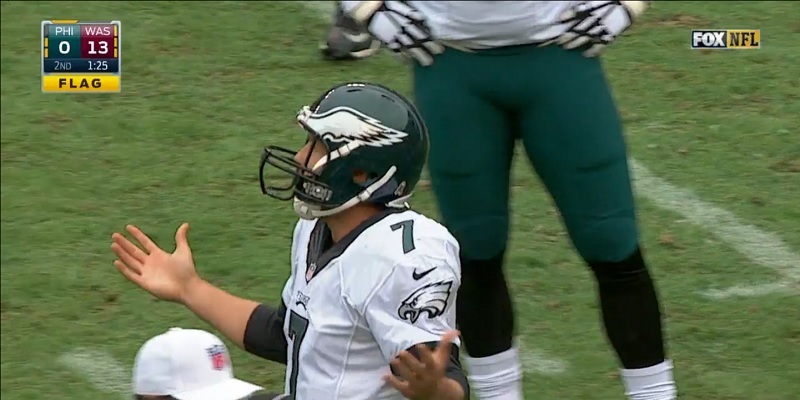 The Eagles scored three touchdowns on their first four second-half drives to take a 20-16 lead. They tried to run out the clock with their four-minute offense, and had some success early in the fourth as the pass-to-run strategy seemed to be working. They drove from their 20 to Washington’s 46, aided by Ryan Mathews ripping off consecutive runs of nine, six and eight yards. 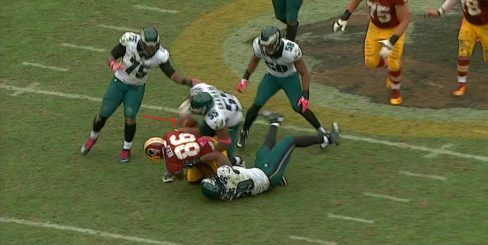 But a holding penalty on TE Brent Celek put them in a hole (and erased that last run). After a 12-yard completion to Austin, and a two-yard run by Sproles, Bradford’s third down pass to Sproles was behind him. It was catchable but wasn’t caught. 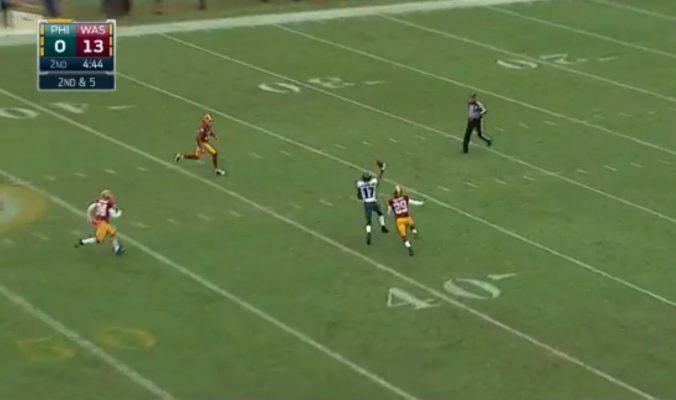 The Birds’ defense, which had been great all night, couldn’t stop Skins QB Kirk Cousin‘s late touchdown drive. Given that three defensive starters (ILB Mychal Kendricks, DE Brandon Bair, and CB Byron Maxwell) had left with injuries early in the game, and that they faced 79 plays due to the offense’s weakness, it’s hard to blame the D.
OLB Brandon Graham pulls the ball out of TE Jordan Reed’s grasp. Eagles fans seem split between the doom-mongers (many of whom have hated Chip Kelly from Day 1, and are thrilled to say “I told you so”), and the optimists, who point out that the 2013 playoff team also started 1-3 before finishing 10-6. Chip noted at his Monday press conference that this team could have been 3-1 if they had made two field goals, which is sort of true if you include the missed extra point Sunday. But it was the wrong thing to say, as was his comment that the team’s problems were due to “execution” (what the players did) rather than talent or scheme (the areas he’s responsible for). As the always level-headed Tommy Lawlor pointed out at IgglesBlitz, the team is playing poorly, and a couple of narrow wins wouldn’t have changed that. Kelly has been good about taking responsibility in the past, and his comments were disheartening — not because they were offensive to fans and maybe the players (though that is also true). The worry is that he didn’t seem to be taking responsibility after demanding full control for the team in the off-season, which would make it hard for him to admit and fix his mistakes. Chip seems to have gotten the message, because he went out of his way at Wednesday’s press conference to take responsibility for the team’s troubles. So where does this team stand? They might make the playoffs, since the NFC East “leader” is a three-way tie at 2-2, only one game ahead of the cellar-dwelling Eagles. But they are going to have to play a hell of a lot better to have any chance of winning even one playoff game. Bradford’s play was encouraging. Despite the sacks, he actually played a great game and showed for the first time the franchise quarterback potential that drew Chip to him. Not only did he pass well, but he took tough shots well, broke the grasp of rushers twice to get off long passes — one for a touchdown to Celek — and scrambled for 14 yards with a nice slide to finish. On the other hand, the offensive line remains a huge problem and it’s hard to see how it could get much better this year. As Chip noted, there aren’t any good OL out there waiting by the phone unsigned, and injuries keep accumulating. LT Jason Peters left the game after playing hobbled for just six snaps, and RT Lane Johnson has been playing through his own MCL sprain. One of the team’s new guards, Andrew Gardner, is out for the season and the other, Allen Barbre, has an unnamed injury. Barbre, Johnson and Peters all missed practice Tuesday. Johnson is expected to play and may slide to left tackle, where he is penciled in to replace Peters in a couple of years. That might be a good learning opportunity for him if he’s not limping too badly, but it will be ugly for him and the Eagles’ running game against New Orleans Sunday. The most likely, mildly optimistic scenario for this team is that this will be a rebuilding year, something that probably should have been predictable with all the roster changes. If Sam Bradford continues to emerge as a franchise quarterback (and isn’t seriously hurt by all the sacks and QB hits), this team could be on the right path if a lot of OL talent is added next off-season, allowing the RBs to shine and the young WRs to develop. If not? The possibilities get really ugly really fast. The Eagles could be staking their future on Cal QB Jared Goff as a top five draft pick, which seems like a really risky way forward.